Please contribute to its necessary financial support. public fear of Chinese Communists. 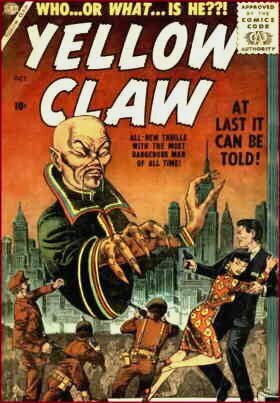 In this atmosphere, The Yellow Claw debuted from Marvel Comics (then using its Atlas imprint) in 1956. The Claw (no relation, even if both are world-class villains from Asia) was as insidious as they come. He was in league with the Chinese Commies, but only as long as suited his purposes — when the time was ripe, he fully intended to stab them in the back. His closest confidant was an escaped Nazi war criminal, Fritz von Voltzmann. But he didn't actually care about anyone except his only living relative, Suwan, a grand-niece. Unfortunately for him, Suwan was totally opposed to his plans. In fact, she was in love with Jimmy Woo, an FBI agent devoted to The Yellow Claw's downfall. The villain was introduced in Yellow Claw #1 (October, 1956). There were three stories about him in that issue. All were written by Al Feldstein, late of EC Comics, which had just contracted severely following the advent of The Comics Code Authority, leaving Feldstein looking for work elsewhere in the industry. The stories were illustrated by Joe Maneely, whose highly distinctive artwork was seen in a wide variety of Marvel/Atlas comics, from Speed Carter, Spaceman to Dippy Duck, and who would undoubtedly have had a very strong impact on the comics field had it not been for his untimely death in a 1958 train accident. Neither Feldstein nor Maneely contributed after the first issue — the former because he returned to EC and became editor of Mad magazine, and the latter probably because editor Stan Lee thought the best use of the star artist was in launching new titles. Jack Kirby, the legendary creator or co-creator of Boy Commandos, New Gods, Fighting American and a host of others, became both writer and artist. He inked his own work on #s 2 and 3, but in #4 was inked by John Severin (whose credits range from a long stint on Cracked magazine to the controversial 2003 Rawhide Kid mini-series). That fourth issue, dated April, 1957, was the last. The Claw's career would have been over, if Marvel hadn't gotten into the habit a few years later of bringing its old characters back as guest stars. The Yellow Claw returned in Strange Tales #161 (October, 1967), as an antagonist for Nick Fury, Agent of S.H.I.E.L.D. Or at least, a robot that looked just like him did; the real Claw wasn't seen again until Captain America #164 (August, 1973). A year or so after that, the original series was reprinted in the back pages of Giant Size Master of Kung Fu. Meanwhile, Jimmy Woo, with Suwan at his side, transfered from the FBI to S.H.I.E.L.D. Since then, The Yellow Claw has had a sporadic career as a Marvel villain (most prominently in a 1978 issue of What If, in which he was used as an excuse to gather Venus, 3-D Man (no relation) and a couple of other characters set in the '50s into an early version of The Avengers). But with "Yellow Peril" style bad guys seriously out of fashion these days (even Ming was de-Asianized in Defenders of the Earth), he hasn't been seen very often in recent years. Today in Toons: Every day's an anniversary! Text ©2003-09 Donald D. Markstein. Art © Marvel Comics.